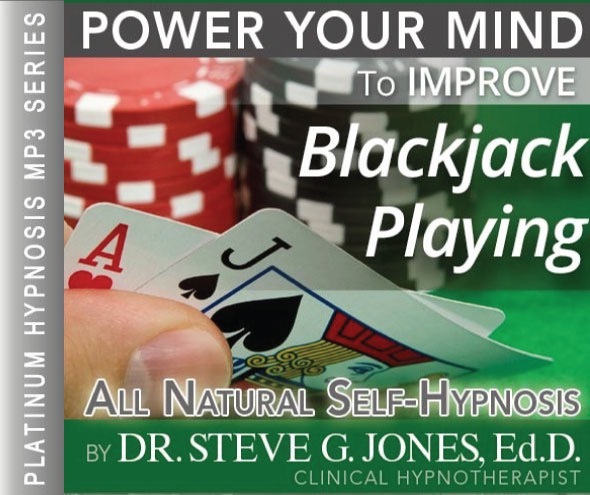 It’s easier than you think with the Improve Black Jack Playing Hypnosis MP3. Steve G. Jones, Ed.D., Clinical Hypnotherapist, charges $1,500 for a custom recording and $25,000 for a one-hour private hypnotherapy session at his office. But you can get all the benefits for this low price. Simply listen to the Improve Black Jack Playing Hypnosis MP3 every night as you go to bed for three weeks and feel the changes happening in your life. You will feel more empowered, more in touch with your true self, and you will truly know that your goals are within your reach. Steve G. Jones achieves AMAZING and LASTING results!!! Hypnosis is the easiest way to affect change in your life because the positive messages go straight to your subconscious mind effortlessly so you can accomplish your goals and reach for the stars!! All you have to do is listen to the Improve Black Jack Playing Hypnosis MP3 session at night as you go to sleep!!! You’ll hear soft music, the gentle sounds of the beach, and the soothing sound of Steve G. Jones’ voice all working together to bring about positive changes in your life easily and naturally. Steve G. Jones has been helping people improve their lives with hypnosis for over 17 years…now it’s time for him to help YOU… don’t wait, do it NOW !!! you’ll be glad you did. See you at the top! And as you continue to relax deeper, deeper, and more deeply relaxed, you realize just how powerful you are. You realize that you are a very intelligent and skillful black jack player, that’s right. Imagine yourself sitting down and playing blackjack, whether online, in a casino, or with friends, it doesn’t matter. Just imagine yourself playing blackjack. Whenever you are dealt cards, you gain the ability to know exactly what to do with them. You know exactly when to hit, when to stand, when to double down, and when to split. You know that blackjack is a game of odds and skill and you have both, that’s right. You know how to calculate the odds in your head and you have great black jack playing skills. As you play blackjack more and more, your intuition gets better and better at outsmarting the dealer. See yourself being dealt certain cards, and making excellent decisions on when to hit, stand, double down, and split. As you listen to the recording, you become better and better at calculating the odds in your head. Every time, you know exactly what to do with your cards. You have complete control playing blackjack. Day by day you get better and better at taking control of the game. You enjoy black jack because you are good at it. You are very confident and capable. Blackjack is a challenging game to you and you enjoy figuring out the odds. Every round is different from the next. In some rounds you realize it is wisest to stand. In others you say hit many times because it’s part of your strategy. You are always confident while playing blackjack. You feel confident every time you say hit, stand, double down, or split. It’s as if you can tell what the next card will be. As you get better and better at figuring out your odds and better at taking risks, you become more and more confident in your own blackjack playing abilities. See yourself become a master at playing blackjack, that’s right. Imagine reaching the magic number of 21 every time. You know exactly when to hit and when to stand, that’s right. The dealer is always amazed at your ability. Day by day as you listen to this recording you are becoming more and more masterful at the game of blackjack, that’s right. You have the confidence and the skill to beat the dealer. You are becoming more and more skilled day by day. You know exactly what tactics to take. You know what your odds are every single time a card is put down in front of you. You have the amazing ability to remember what cards have already been used and which ones are still waiting to be played. You know what the next card is at the top of the deck. You are a highly skilled blackjack player. Imagine yourself one year from now. Imagine how great of a blackjack play you are now, that’s right. You are a master at blackjack playing. Imagine the feeling of beating the dealer in a game of blackjack. Absorb that feeling. It feels so good. You are now used to this feeling, this feeling of winning at blackjack because you play winning blackjack. You are skilled and confident at playing blackjack. You enjoy the challenge and the thrill when you are first dealt your cards and figuring out what you should do with them. You have mastered the art of playing blackjack. Others find it very challenging to play with you because you are dominant at blackjack. You have developed the skills needed to become a masterful blackjack player, that’s right. You are a masterful blackjack player. You have improved your skills and it shows. You know exactly what to do with your cards. You know when to raise the hit. You know when to stand. You know when to double down. You know when to split. You know when you have the cards needed to win the round and you know how to play them at all times. And as you relax and drift, you realize that you are a master at blackjack, and that feels wonderful. Blackjack, or 21 as it is commonly called is the most widely played casino game in the world. Success with blackjack has to do with both chance and skill. Luckily, hypnotherapy can help with both of these. This hypnosis program will greatly improve your ability to play blackjack and be successful at it! The Improve Black Jack Playing Hypnosis MP3 audio helps in both areas of luck and skill in relation to blackjack. Hearing positive suggestions about luck, through this hypnosis program will enhance your luck in relation to blackjack. As you continue to listen to the recording and play blackjack, you will notice your luck improving. Hypnotherapy is very powerful and it has powerful effects on your subconscious mind and your luck! The Improve Black Jack Playing Hypnosis MP3 session will also help you improve your skills in relation to blackjack. Blackjack requires that you know the rules and you know when to take certain action while playing. Hypnotherapy will help you with this process so that you always know the right move to make.